How We Choose Our Favorite Sunscreens! Life with kids is busy and expensive. Our calendars are bursting with soccer practice, little league games, family outings, and other various school commitments and activities. The last thing we want is to spend even more of our valuable time and money trying to figure out which sunscreen is best to use on our kids. 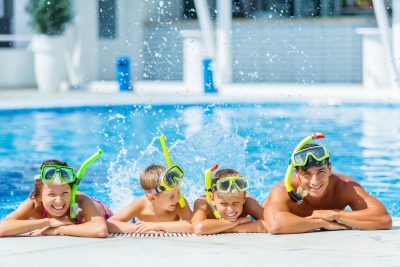 That is why here, at Sunscreen Scout, we have done the work for you and compiled a list of safe and budget friendly mineral sunscreen for you and your family. All of the sunscreens on our list are rated “1”, the highest rating for safe ingredients, on EWG and have numerous high reviews by Amazon customers. 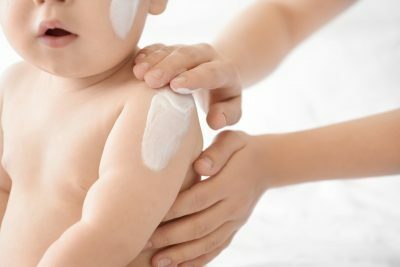 According to the American Academy of Dermatology, if sunscreen is applied properly, a 3-ounce bottle of sunscreen may only last 6 applications on a baby or small child. For this reason, we prioritized price per ounce to ensure you get a great deal. We understand that choosing a sunscreen is a personal preference, so we also included ease of application and scent to make it easier to pick your favorite one! We hope this makes shopping for sunscreen much easier! Enjoy! Learn more about the importance of using mineral sunscreen and why you should avoid chemical sunscreen. Subscribe to the latest update via our newsletter! Why It’s Great: This sunscreen is a personal family favorite! We have used this on ourselves and on our son during bike rides, park play dates, and swimming! It is easy to apply and does not leave a white cast once it has been fully rubbed in. Goddess Garden receives top marks from EWG and is great for sensitive skin and free of harsh chemicals. We are so happy to see that this sunscreen is the best value for kids! Application: Shake before using to reduce product seperation. Goes on thin, but a little goes a long way! Skin will have a white sheen until fully absorbed and rubbed in. Why It’s Great: This sunscreen is great for UVA/UVB protection and is reef friendly. 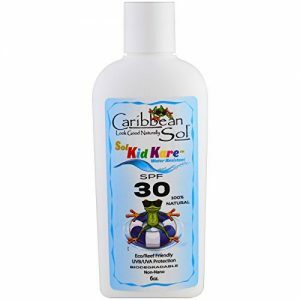 We love that Caribbean Solutions Sol KidCare Sunscreen is biodegradable and does not contain parabens or artificial dyes. It has a fruity scent and a tear-free formula that is great for kids! Ease of Application: Goes on a little thick, but rubs in to the skin easily and the white cast will fade over time. Why It’s Great: We love this sunscreen because it is free of biologically harmful chemicals. No Avobenzone, Oxybenzone, or UV Chemical absorbers. It is also produced in the USA and smells like an orange creamsicle! 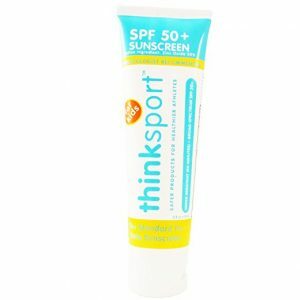 We love that it is gluten free (third party verified) so those with celiac or gluten sensitivity can have peace of mind when using ThinkSport Kid’s Safe Sunscreen. Ease of Application: Goes on thick, but absorbs quickly. May leave a white cast if not rubbed in well. 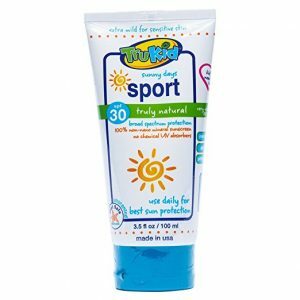 Why It’s Great: We keep this in our son’s backpack so while we are out and about we can easily re-apply our sunscreen! 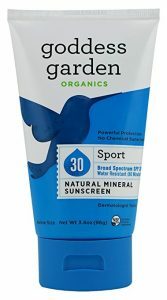 The Goddess Garden Organics Kids Sport Natural Sunscreen is water resistant for 80 minutes, so it is a great option for sports, swimming/splashpads, and the beach! It is a simliar formula to the Goddess Garden Organics Natural Sunscreen as well. Ease of Application: Shake before using to reduce product seperation. Goes on thin, but a little goes a long way! Skin will have a white sheen until fully absorbed and rubbed in. Why It’s Great: We love that TruKid originated from a mother of 6 who wanted a safer skincare option for her children. It is the winner of the Red Tricycle Award for “Most Awesome Sunscreen” that was selected by thousands of families as their favorite family-friendly sunscreen! TruKid Sunny Days Sport Sunscreen provides UVA/UVB protection with a variety of organic ingredients while being water and sweat resistant for up to 80 minutes. It is also safe to use on sensitive skin, especially those with eczema. One thing that sets TruKid Sunny Days Sport Sunscreen apart is that is is biodegradable with 100% recyclable, BPA-free PET plactic packaging. This is great for you and the environment! Why It’s Great: The Badger Brand has always been a family favorite! We have used a variety of their products and have always had a great experience. We love that they are a family owned business and are always striving to improve the quality of their products! What makes the Badger Baby Sunscreen great is that it only takes 6 ingredients to make such a great product! This sunscreen provides Broad Spectrum Protection and is gentle for sensitive skin. We were surprised to see Badger Kids Sunscreen lower on the list, but due to their high price per ounce, it bumped them down to the #6 spot. 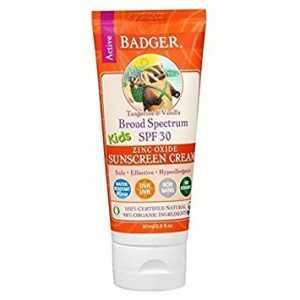 If you can afford it, then Badger Kids Sunscreen Cream is an amazing choice! Ease of Application: Thick, but quick to absorb into the skin. A little bit goes a long way! Why It’s Great: We love it when companies can create a product with such few ingredients that are easy to decipher. 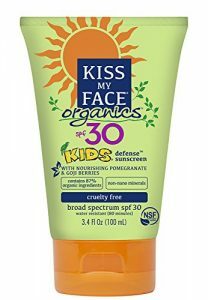 Kiss My Face Organics Kids Sunscreen has only 7 ingredients! As parents it gives us peace of mind of what we are putting on our kids without compromising their health. This sunscreen also contains antioxidants such as pomegranates and goji berries which can help fight free radicals and the visible signs of sun damage. The price is a little expensive for the amount in the bottle, but it is a great option! Ease of Application: Easy to rub in, but may feel a little greasy. Why It’s Great: Created by Keven Dunn, an Environmental Scientist and Surfer, who has a family history of skin cancer was determined to create a functional and effective sunscreen. He moved to Hawaii to begin is research and finally developed BurnOut Sunscreen while ocean testing in Indonesia. 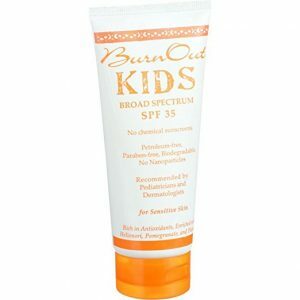 BurnOut KIDS Sunscreen is produced in California and is chemical-free, paraben-free, petroleum-free, and PABA-free. It is full of antioxidants, hypoallergenic, non-comedogenic, non-greasy, and perfect for sensitive skin! Ease of Application: Applies light and easy. Absorbs well without feeling sticky or greasy. Why It’s Great: This sunscreen is great if you are looking for a formula that is water resistant for up to 80 minutes and provides UVA/UVB Protection. We are surprised that the bottle is so small at 2oz, but it would be a great option to keep in your diaper bag or airport carry-on luggage while traveling. 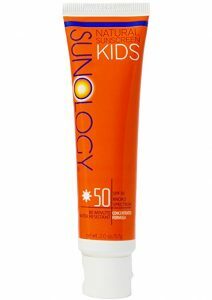 Sunology Natural Sunscreen is produced in the USA and is free of oxybenzone, avobenzone, parabens, PABA, octisalate, homosalate. This is a great option for those with sensitive skin! Ease of Application: Smooth and gentle application, but needs time to rub in to fully absorb into the skin. Why It’s Great: This sunscreen is the most expensive for the price per ounce coming in at $7.87 in a 2.54oz bottle. Even though it has high price point, it was important to include this on our list because it is such a great product! It is non-comedogenic, which will not clog pores, and water resistant for up to 80 minutes unless swimming, sweating, or towel drying. MD SolarSciences KidCream Mineral Sunscreen is also gluten and paraben free. 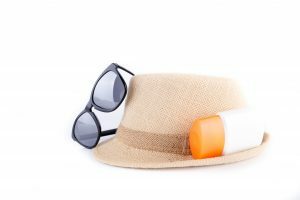 This sunscreen is TSA approved so can be a great option while traveling! Ease of Application: Need to shake the bottle before applying. Creamy, gentle, and easy to apply. We take the guesswork out of shopping for a safe and natural sunscreen. That way you can spend more time enjoying the sunshine with your family! Learn more about the importance of mineral sunscreen. Mineral vs Chemical Sunscreen – What is the Difference? When protecting your family from the sun, it is important to know what is in your sunscreen. The two main types of sunscreens are Mineral and Chemical.